Yesterday’s post was about the earthquake resistance of earthbags. Today’s post illustrates what an earthquake resistant gravel bag foundation looks like and explains why this design is so effective. Gravel is an ideal material for this application because it’s durable, reasonably inexpensive, readily available in most areas, has high bearing strength and prevents wicking of moisture up in the wall. Gravel will shift or ‘give’ during seismic activity, thereby relieving stress without causing structural damage. The gravel is contained in polypropylene bags or tubes, double-bagged for strength. The gravel bags rest directly on a typical rubble trench foundation with a French drain that removes water from under the building. Two courses of 4-point barbed wire between courses reduce slippage and provide tensile strength. Vertical rebar or bamboo pins are placed opposite each other and tied together through the wall with sturdy baling twine. Plaster mesh, fishing net or plastic fencing is tied to both sides for additional seismic resistance. Typical soil-filled earthbags are placed on top of the gravel bags once you’re safely above where moisture can cause problems. Gravel bag foundations score highly in every category: ease and simplicity of construction, dirt cheap cost, durability (poly bags can last 500 years if protected from sunlight) and earthquake resistance. No concrete forms needed — just a few simple tools such as a shovel. I highly recommend reviewing some previous blog posts on this subject to better understand why earthbag foundations are a favorite among natural builders. – A similar gravel bag foundation with strawbale walls successfully passed a shake table test in Nevada with forces that surpassed that of the Northridge quake in California. 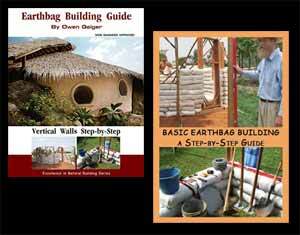 – Another Earthbag Foundation Method explains an alternative way of building a foundation with gravel bags. This is a great idea for developing countries with a lot of seismic activity. I like the idea of using bamboo since it’s not only natural but flexible and will help absorb and sway with the shocks and aftershocks. Does the system pass an ASTM test for seismic resistance? The Nevada test that I mentioned was an ASTM test, so yes it would. The trouble with the tests is building officials in each county will require the same test to be repeated. It costs hundreds of thousands of dollars to create a product that’s code approved everywhere. And since there’s no profit in this design (people will build their own because it’s so simple) companies will not invest in the necessary testing. So here’s another example of how building codes fall short and average people get screwed. 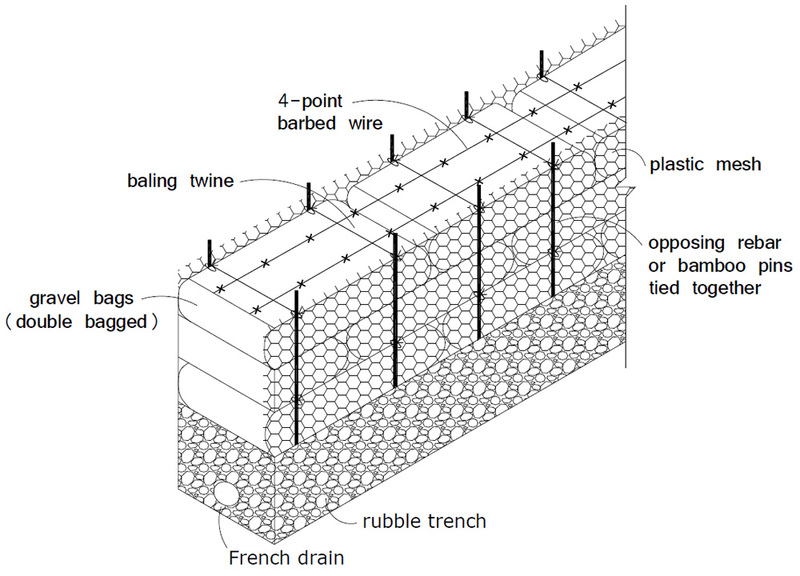 Are the rebar and net connected in any way at the bottom, like folded under the bottom bag or something, or are they just tied in, ending at the trench? Also, does this system end at the top of the foundation bags? It would be a huge savings not to have to use the mesh all the way up the wall, at least on single story buildings. There are numerous ways to build it. The mesh could go under the gravel and up the sides. It could also continue over the top of the bond beam. The mesh could wrap around the gravel bags only. The final design depends on the seismic zone rating. Higher risk zones need additional reinforcing. If you zoom in you’ll see this drawing shows the bottom of the rebar is tied through the wall with twine.